I reviewed Merlin Mann’s Inbox Zero talk at Google in this previous post, and suggested that Facebook could help create a new class of messaging, in keeping with the recommendations in The 4-Hour Workweek , that makes less-frequent checking of email a practical reality. I said I would elaborate in a future post. The future is now. But first, let’s look at the past. Merlin was full of wist as he recalled his first email account in 1993, and how special each message felt because only a dozen or so of his friends had email. Email was a much more personal experience then. Now it threatens to overwhelm everything, with many people living most of their lives in their email inboxes. This should not be. There’s much more to life. 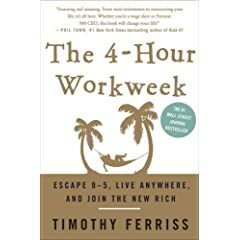 In his New York Times bestseller, The 4-Hour Workweek , Tim Ferriss suggests that a key to productivity and a fulfilling life is to go on a low-information diet and eliminate distractions so you can focus on priorities and actually accomplish important things. Due to high workload and pending deadlines, I am currently responding to email twice daily at 12pm et and 4pm et. But what about people who need to be more available, whose success depends on timely response to key customers? What if responsiveness is one of your important priorities? For example, if you work in PR and a reporter with whom you are developing a relationship sends out an email to several potential interview sources, you don’t want to wait a few hours to find out about it. Someone else will have responded and will be in the story. And sometimes you’re not at your computer. You’re in a meeting or otherwise having a life. News doesn’t happen in a predictable 8-5 schedule. So how do you stay in touch? One “solution” to prevent missing an important email message when you’re out at a meeting is to have your Blackberry set to vibrate each time you get a new message. I used to do that. It was extremely disruptive. And it’s rude to have the Blackberry on silent mode, and then just pulling it out every so often to check messages. It tells people with whom you are meeting that they don’t have your full attention. Because they don’t. With Facebook, you can recreate Merlin’s Edenic email world of 1993 all over again, and establish a priority level for your messages that goes beyond flagging in regular email.After all, if you’re only checking email twice a day, it doesn’t matter whether the message is flagged as highest priority or not: you’re not going to see it until you log in. That’s why you need an alternate way for people to get in touch when they really need you urgently. If you use the Mobile application in Facebook, you can receive a text message delivered to your phone whenever someone sends you a message, or pokes you, or writes on your wall, or sends you a friend request. Due to high workload and pending deadlines, I am currently responding to email twice daily at 11 am CT and 4 pm CT. If you require help with something that can’t wait until either 11 am or 4 pm, please call me on my office phone at 507-266-2442 during regular business hours, and ask to have me paged if I’m not at my desk. Another way to reach me quickly any time is though Facebook (www.facebook.com). If you’re not in Facebook yet it’s easy to sign up, and 150,000 people a day are joining. Search for Lee Aase in Facebook (I’m the only Lee Aase there…one of the benefits of a unique name), and click Send Message. I will get an alert text message sent to my cell phone, so I’ll know you’ve sent me an urgent message. I’ll get back to you right away. Thank you for understanding this move to greater effectiveness. I hope it will mean that I will be able to completely respond to the non-urgent messages on that regular schedule, and give everyone the service they need. Michael Hyatt says his experience with the 4-Hour Workweek method has made him more productive, and he’s the CEO of a major publishing company. If you click the link above you’ll see how he’s tailored the Ferris formulation of the email autoresponse. Even someone as promiscuous is accepting Facebook friend requests as Robert Scoble is would not likely be overwhelmed by text messages in this system. I’m one of Robert’s 4,701 friends, but I’m unlikely to send him a message unless I think it will be REALLY interesting. If someone sends you a message in this way through Facebook that you don’t think was urgent, you can let her know that this was one that could have waited. And if she persists in not respecting the boundary you’ve set, you can block further Facebook contact. In this way, Facebook can be not only the Spam Killer because it lets you segregate personally meaningful messages from everything else, thereby turning back the clock toward Merlin’s email Camelot; when combined with your cell phone and Facebook Mobile it also can serve as a 24-hour pager that alerts you when someone truly needs to get in touch urgently. If you’re one of the self-employed “new rich” Tim Ferriss describes, giving your cell phone number may be the best and simplest way to let people reach you urgently. If you work for a company where someone answers your phone when you’re not able to take a call, maybe this work phone/Facebook message option will be a good option, instead of giving your personal cell phone number to anyone, including spammers, who sends you an email. We’ll see. woo hoo! i thought i was alone when i reacted to Ferriss’ thoughts on email. I think you are absolutely right – Facebook is an ideal communication tool for some folks and the usage model will be refined over time.